Recipients of 2018 OCAD University Research Seed Grant, Associate Professor Cheryl Giraudy and Assistant Professor Saskia van Kampen, Faculty of Design have just launched a two­-year research effort with the working title Design ManifesT.O 2020: creating new ideas for Toronto. The project has begun with an audit of past and ongoing proposals, movements, policies, and calls to action that evolve art, design and creative endeavours of place­making as part of transforming the city, including aspirations for greater equity, democratic reform, infrastructure, transit, amalgamation, and neighbourhood redevelopment. 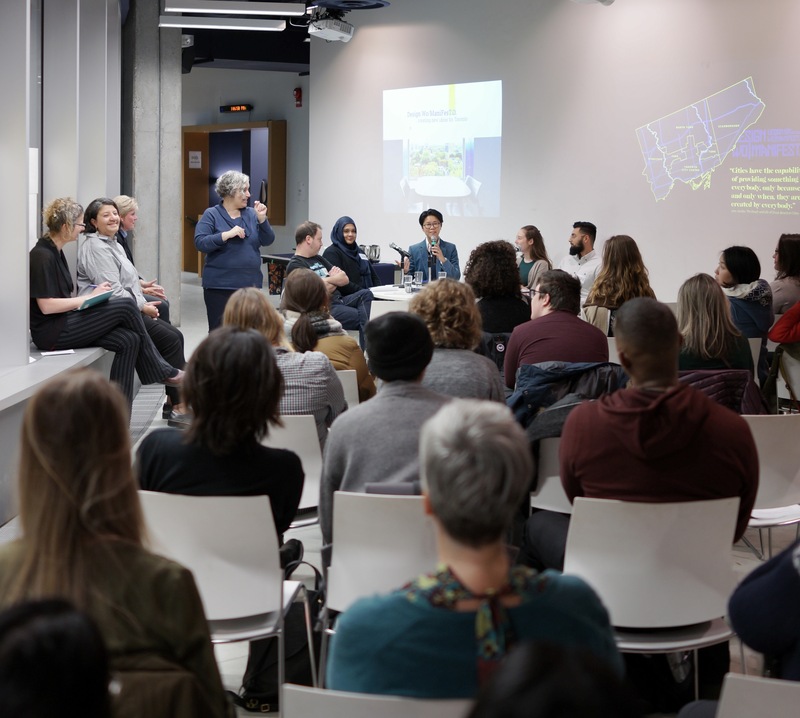 The project launched with a public panel discussion as part of the 2019 DesignTO Festival at the Open Gallery, 49 McCaul. The panel of community­-based activists, writers, critics, and makers, moderated by Councillor Kristyn Wong­Tam, Toronto Centre Ward 13, shared their stories for grassroot endeavours and disruptive strategies for place­making and included Author Dave Meslin, Community organizer Sabina Ali, Manager, Community + Policy Connections Ajeev Bhatia, and Public Art Critic Sarah Ratzlaff. Research Assistants Christine Xia and Samantha Matters contributed significantly to efforts of planning, and research collection. The research team has begun planning the second forum in collaboration with potential sponsors, and aimed for Scarborough neighbourhoods, to gather/listen to citizen efforts for community-based creative placemaking. In conjunction with faculty partners, early plans for a ‘Creative Practice as Protest Workshop’ with Colloqate.Org, an award winning community platform for racial, social, and cultural equity in city­making, are being discussed, potentially aligned with a student competition for new ideas for Toronto. Stories and information collected from all events, forums, workshops, as well as interviews, will form a rich database to explore and ideally manifest a creative artefact, be it video, book or toolkit for planning Toronto 2020 and beyond. This event is a collaboration between Canadian Creative Writers and Writing Programs (CCWWP), TIA House (University of Calgary), and OCAD University, Creative Writing, co-sponsored by the Writing and Learning Center and organized in conjunction with the CCWWP board meeting to take place Sunday, October 29th at OCADU. The October 28th 2017 program is free and open to OCAD University students and faculty, students and faculty from across Turtle Island, CCWWP members, Toronto writers and the general public. Please write cblack@faculty.ocadu.ca to confirm your presence using the subject: Writing in Dangerous Times RSVP. OCAD U is committed to providing an inclusive and barrier-free experience to students, faculty, staff, and visitors with accessibility needs. This event is fully wheelchair accessible. All panels will take place in OCADU’s Learning Zone, on the ground floor, room #110, 113 McCaul. The Learning Zone is a wheelchair accessible space with two accessible washrooms and no fixed seating. This is a mic’d event. The Learning Zone is accessible through the McCaul or St. Patrick Street entrance at 122 St. Patrick St. Parking is available in the underground lot directly below the venue, with handicapped parking closest to the elevator at the McCaul Street entrance. The cost of parking is $15 daily maximum, $6 evening maximum. Please contact 416-977-6000 extension 2205 or accessibility@ocadu.ca for information on the best barrier-free routes on campus, Wheel-Trans pick-up and drop-off points, locations of elevators and accessible washrooms, requests for ASL translators, or information in alternate formats. The students have the concepts, the sewing collective has the skills. Second-year Industrial Design students are teaming up with a sewing collective run by women in Regent Park to create marketable products and a potential source of added income for the community. 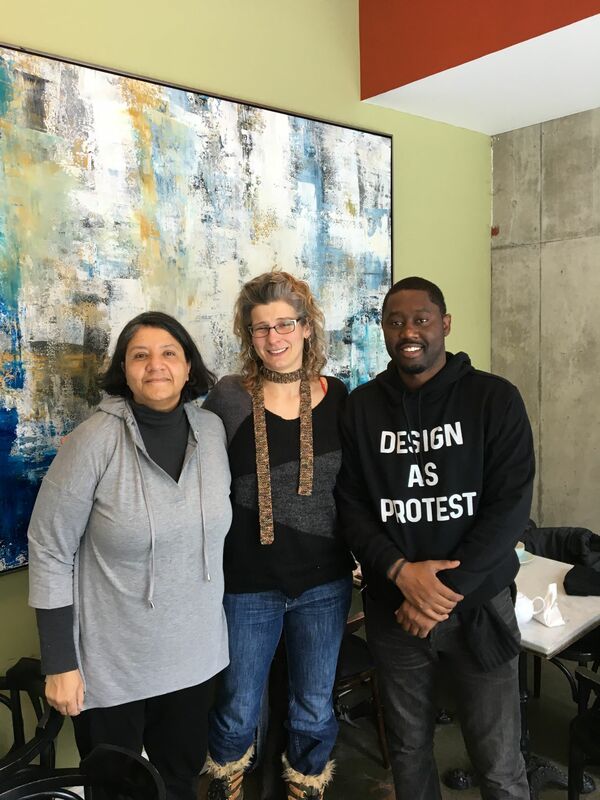 The collaboration came about when assistant professor Ranee Lee met with Angela Draskovic, president of the Yonge Street Mission, to discuss how design for social innovation can fit in with Toronto’s Poverty Reduction Strategy. Lee learned about projects going on in Regent Park and found a way to integrate the sewing collective into her existing curriculum for the design course Identity Materialized, giving students an opportunity to engage in experiential learning. 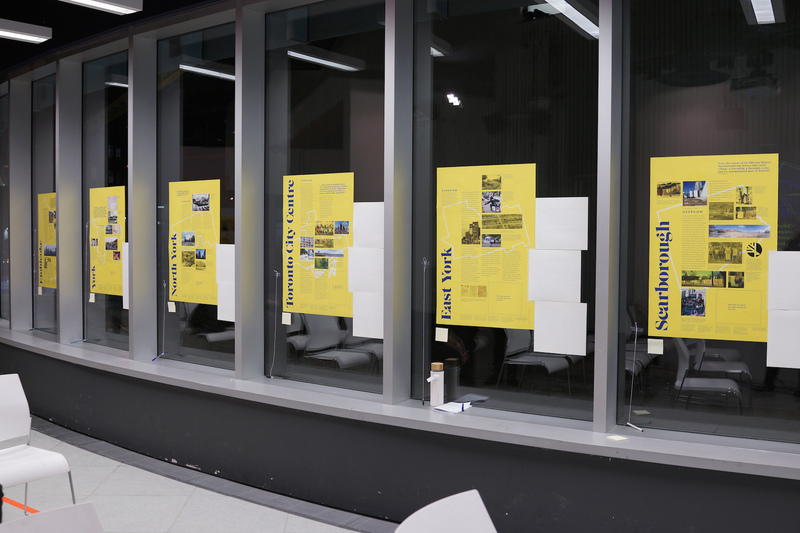 Members of the collective welcomed the students to their workspace at a Gerrard St. community centre in November. They started the collective as a way to get together with other women and sew clothing and household goods. The students are now taking what they learned from members of the collective and applying it to a soft goods project in class. This involves designing products that can be produced locally by the collective, developing a brand identity that reflects the revitalized Regent Park, conducting market research and creating advertising for the collective and its products. 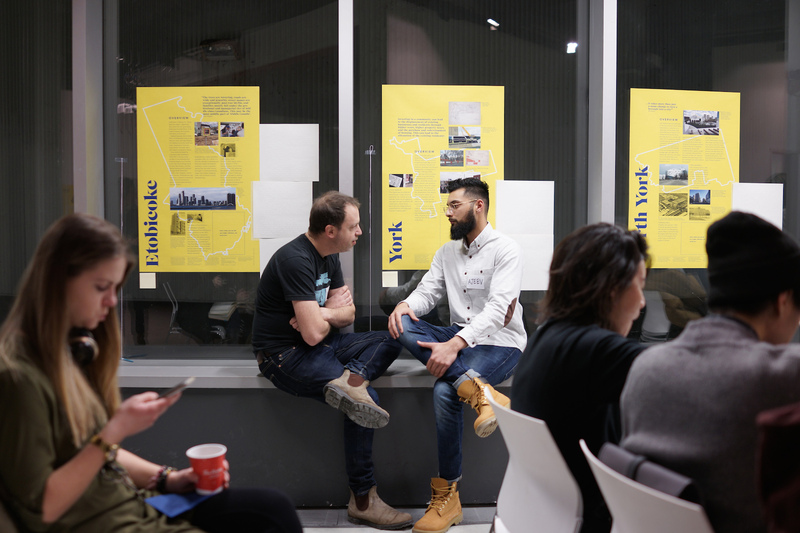 In December, members of the collective will come to OCAD University to hear the students present their design ideas and, in turn, to give their own feedback and input.